Hey everyone! Hope you're all having a relaxing Labor Day weekend. I can't believe tomorrow is the first day of September. Where did the summer go?! Soon I'll be switching over to darker polishes, but today I did a mani using Essie Splash of Grenadine. 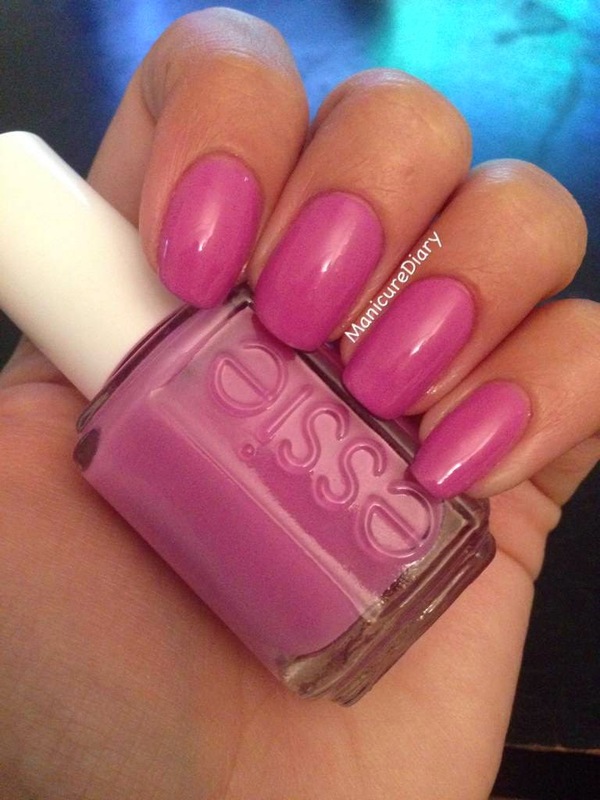 It is described by Essie's website as "a playful magenta pink." I love this color, especially for my toes, but the formula is a little thicker than I like. I found it difficult to work with, which has never been an issue with my other Essie polishes. I'm at my boyfriend's apartment all weekend and I knew I would want to change my polish so I just brought my supplies with me. 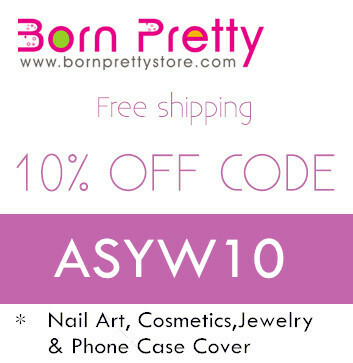 To read more about my nail prep products from a previous post, click here. Sally Hansen Insta-Dri: My HG top coat. I absolutely love this stuff! OPI Nail Envy: I use this whenever I feel like my nails need a little boost and it keeps them strong. 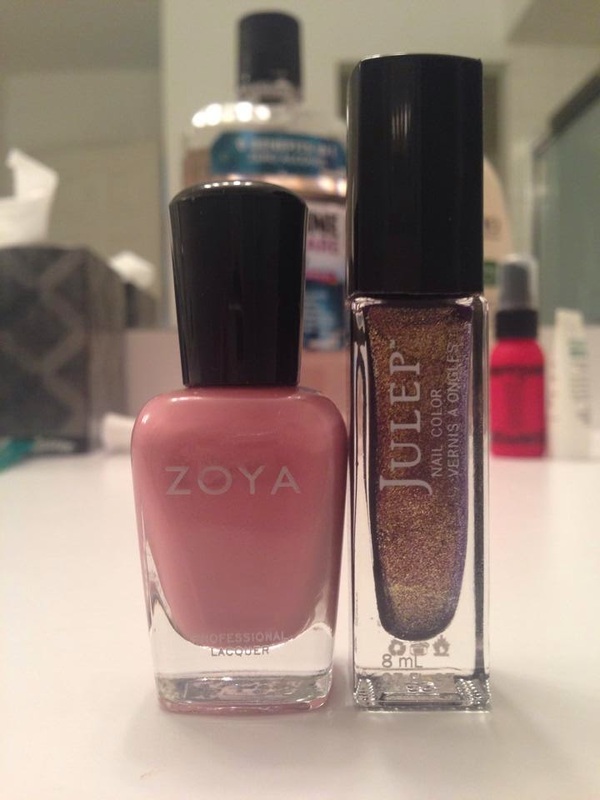 Zoya Remove: How cute is that mini bottle?! Plus it is great for traveling. Check out my review of Zoya Remove here. I also brought cotton balls to remove my previous mani and some Q-tips for clean up. It was weird doing my nails away from home! My boyfriend wasn't a fan of the smell, but he liked the end result! Hey everyone! 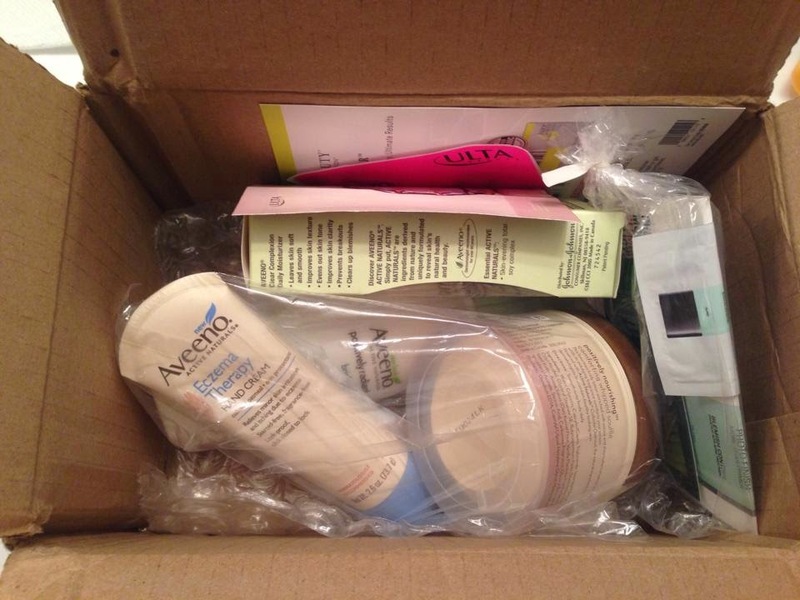 I recently ordered a few things online from Ulta and received my package this week. I needed something from Aveeno and saw that they were doing a buy two get one free promotion, plus a free gift, so I thought that was a pretty good deal. 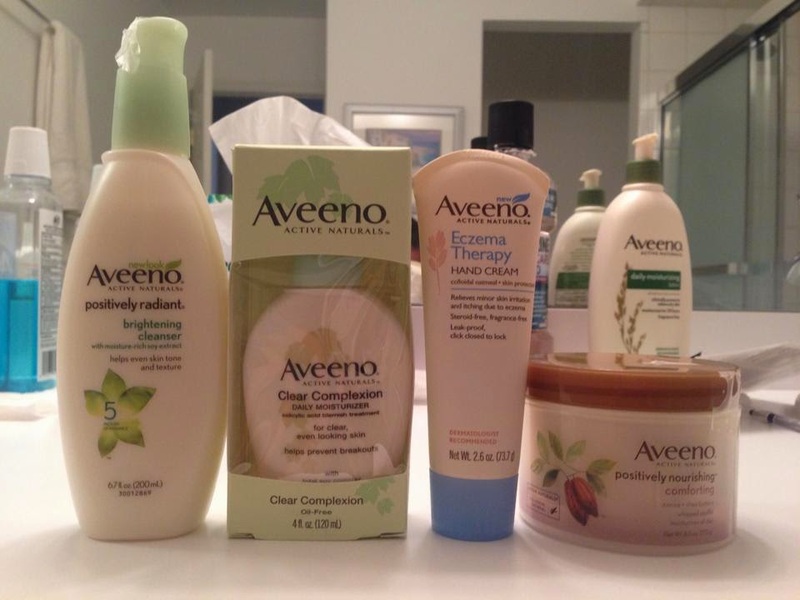 I love Aveeno products because I have very sensitive skin and everything I have tried from them has been so gentle. I also love that they make products that are fragrance free. Ulta gives you the option to received samples with your online purchase. Unlike Sephora, where you get to choose your samples, Ulta sends you a random assortment. Here are the three samples I found in my box. 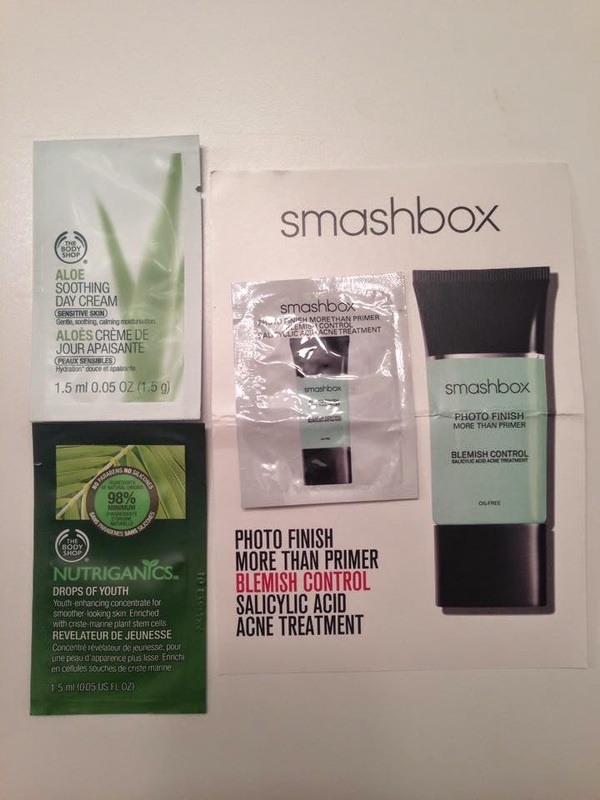 The Body Shop Aloe Soothing Day Cream, The Body Shop Nutriganics Drops of Youth, and Smashbox Photo Finish More Than Primer. It honestly feels like there is nothing in these foil packets, but I guess small samples are better than no samples! You can see my much loved Aveeno daily moisturizer in the background! Aveeno Positively Radiant Brightening Cleanser (6.7oz/$7.99): This is the product I received as a free gift with my purchase. I've been using it to wash my face and it makes my skin feel clean and refreshed. It does not dry my skin out at all. Aveeno Clear Complexion Daily Moisturizer (4oz/$17.49): The price tag for this moisturizer seems high, but I'm still using the one I bought over a year ago! This stuff lasts forever because you only need a little bit. It absorbs quickly and does not leave my face feeling greasy. I have noticed a visible difference in the brightness of my skin over the past year. It even minimized my breakouts, which is fantastic! Aveeno Eczema Therapy Hand Cream (2.6oz/$5.99): I have a few small patches of eczema on my palms and fingers and have a hard time keeping it cleared up. I've heard great things about the Aveeno Eczema Therapy Cream, so when I saw this new hand cream I figured it would be worth trying. I love that it is fragrance free and it absorbs quickly. Nothing is worse than a heavy, greasy cream on your hands. The packaging claims that this hand cream provides visible improvements in the appearance of hands in just one week. Maybe I'll do an update next week to let you know if it made a difference for me. Aveeno Positively Nourishing Comforting Whipped Souffle (6oz/$7.99): The moisturizer and hand cream were the two items I needed, so I had to choose my "one free" and thought this product looked interesting. I tried it after showering today and it made my skin feel so soft and moisturized. I think I'll save this for the winter and continue using my Aveeno Daily Moisturizing Lotion until then. I hope some of these product reviews were helpful for you! If you have sensitive skin or prefer fragrance free lotion I definitely recommend trying Aveeno. Hey everyone! The manicure I'm going to share with you today features a polish I bought months ago, but never used. I am so happy I decided to try it! The color is Sinful Colors Endless Blue and it is absolutely gorgeous. 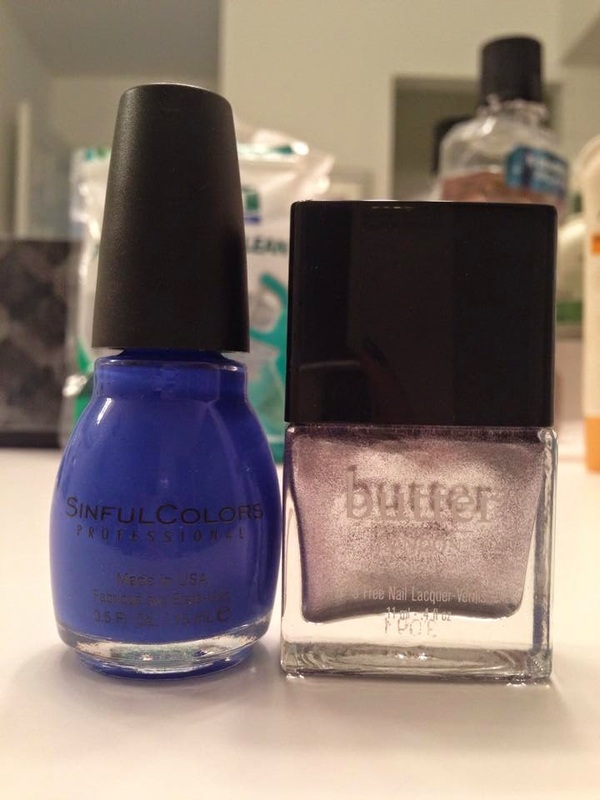 It is a bright cobalt blue and the formula is lovely, especially for an inexpensive drugstore polish. I wanted to dress it up a little on the ring fingers with a fun stripe accent. 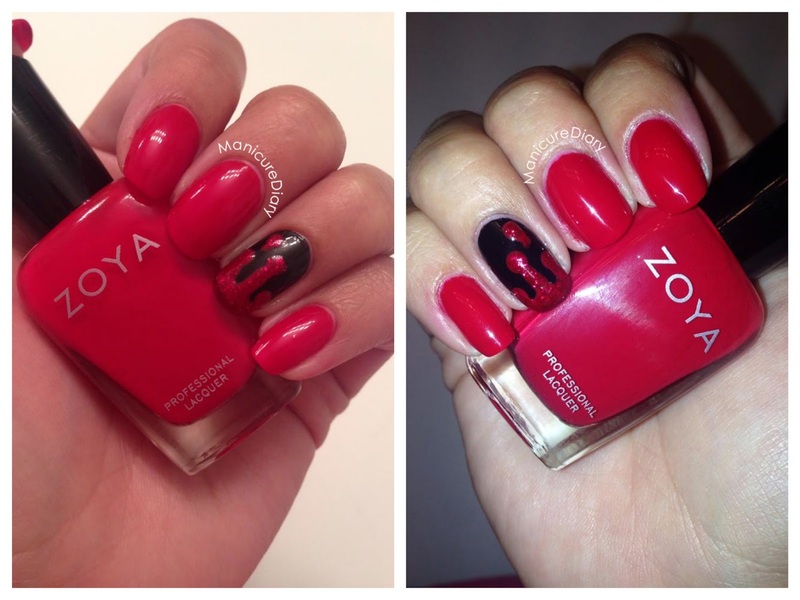 Zoya Sooki -True Blood Manicure! Hey everyone! HBO's True Blood season finale airs this Sunday night, August 24th, and I'm so sad that it's almost over. In honor of the final episode, I did a manicure dripping with blood (and it's glittery!) I used Zoya Sooki, a gorgeous bright cherry red named after Sookie Stackhouse. 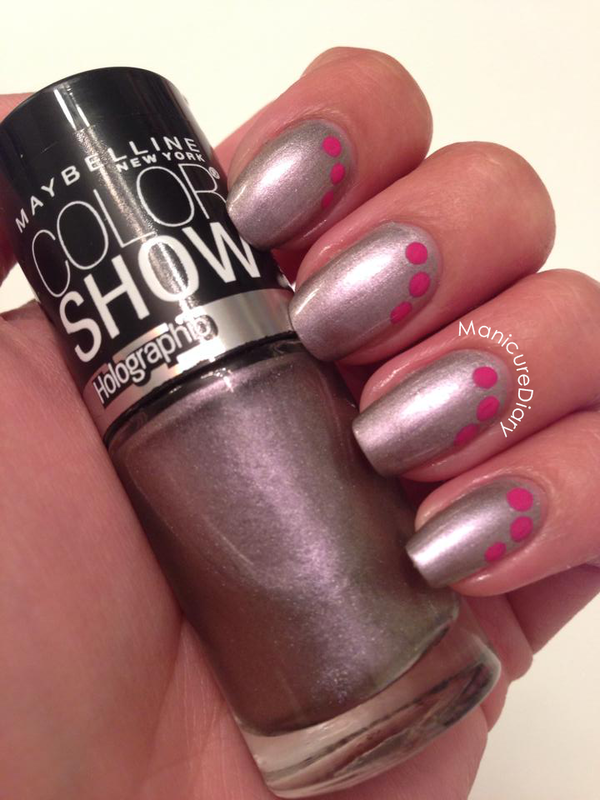 The application is so smooth and you could easily get away with one coat, although for this mani I used two. For my accent nail I used Avon Rapid Black. Those sparkly drips of blood were made with a dotting tool and a detail brush using Zoya Sooki and a little bit of Julep Martina on top. And now I leave you with a quote from one of my favorite True Blood characters! Hey everyone! 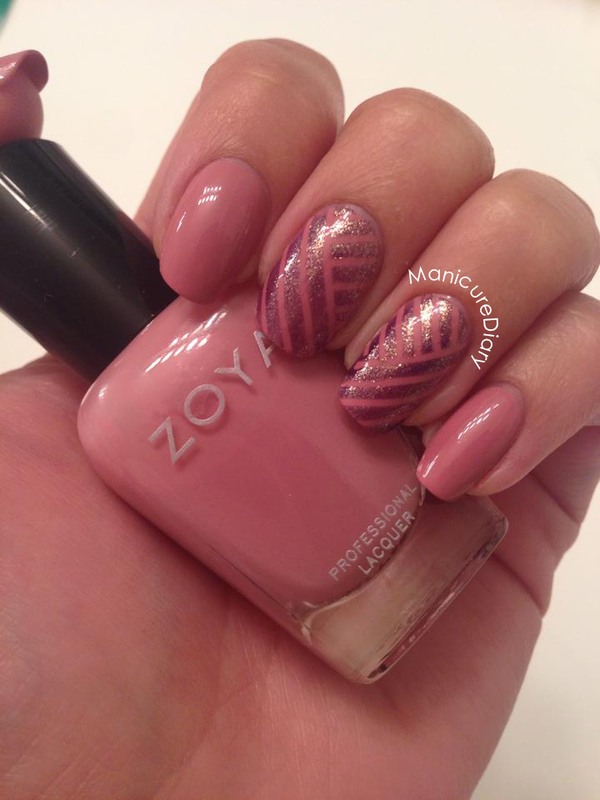 A couple weeks ago Zoya ran a promotion to get a free nail plate with the neutral shades from the Naturel and Naturel Deux (2) Collections. I jumped on this opportunity to see the colors against my skin tone! 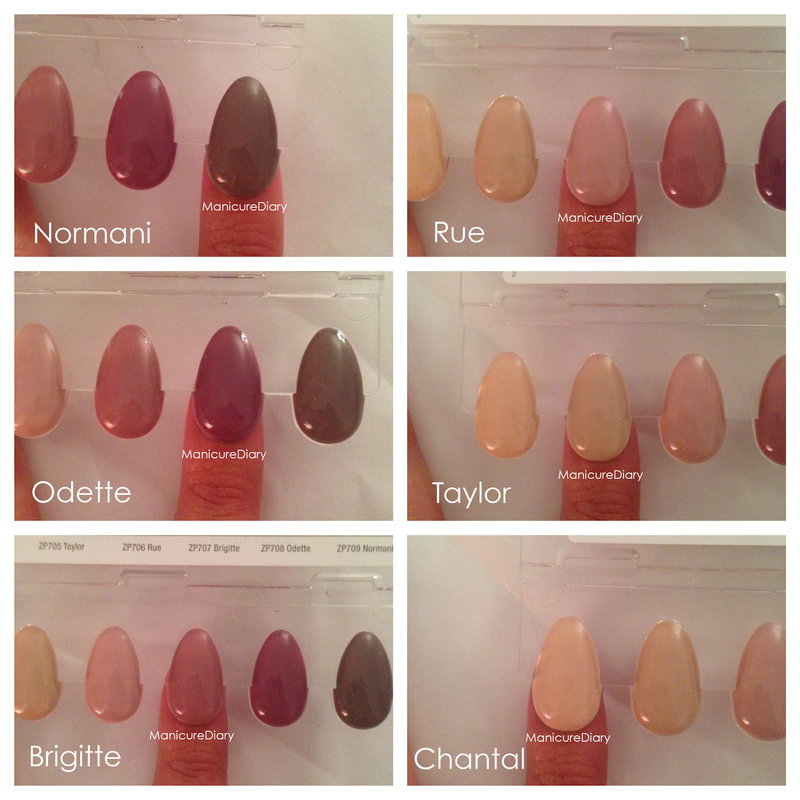 I received my nail plate in the mail today and I am very excited to share the swatches with you. I'm really loving both collections, but if I had to pick one favorite from each I would choose Rue from Naturel and Aubrey from Naturel Deux (2). 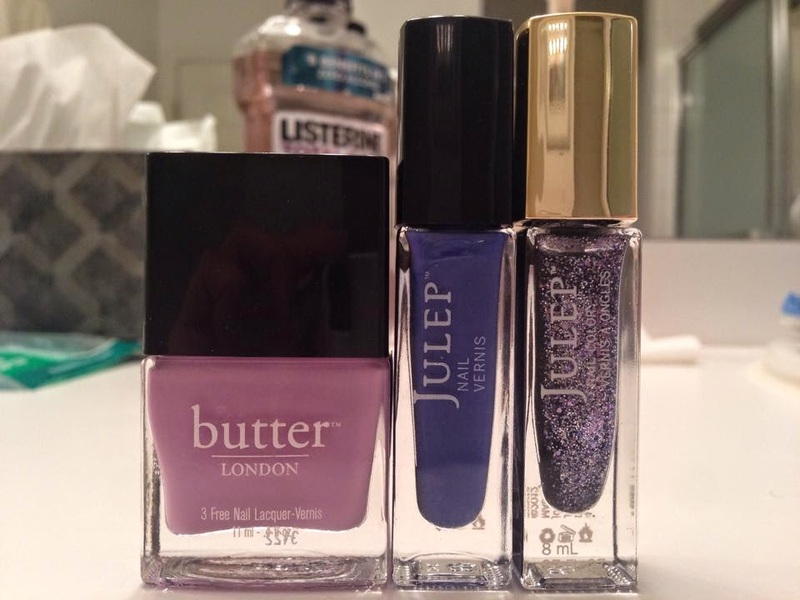 I can't wait to get my hands on the actual polishes! 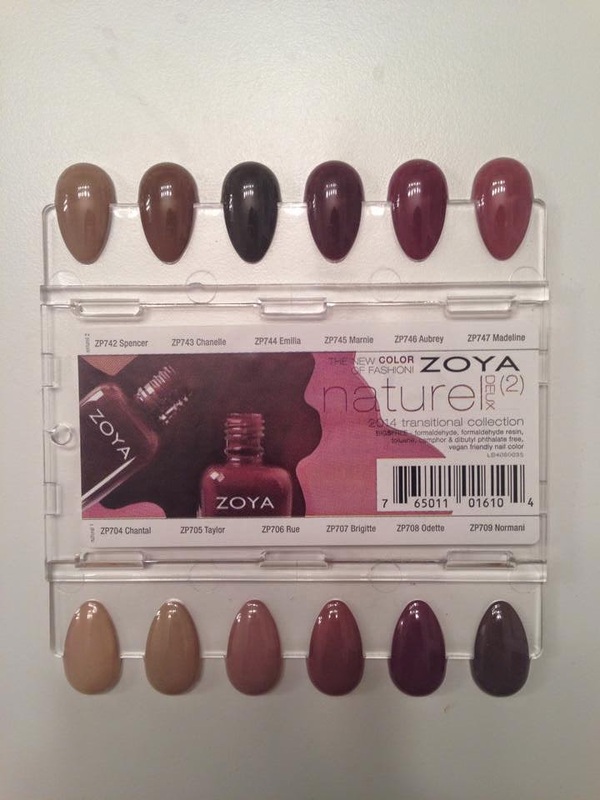 You can check out the Naturel Collection on Zoya's website. Hey everyone! I got home from work today and there was a package for me. I hadn't ordered anything so I had no idea what it could be. 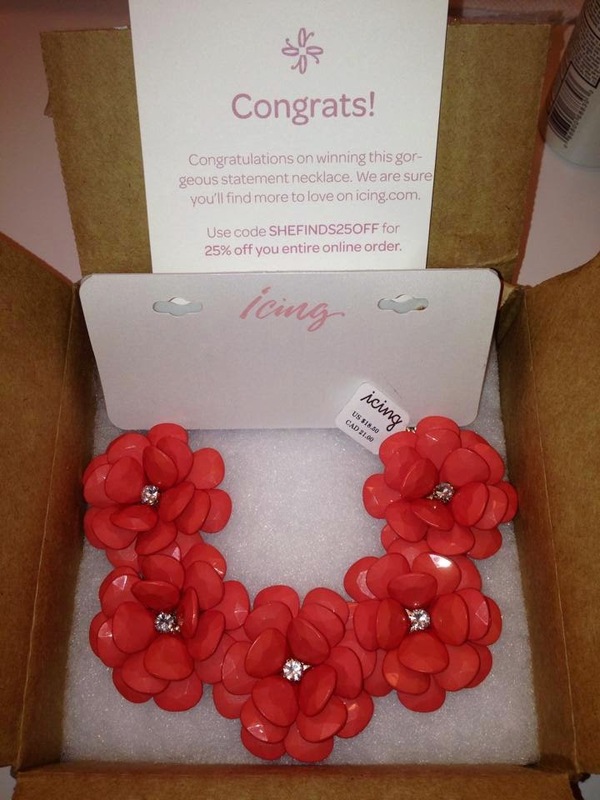 Turns out I had finally won something from a SHEfinds Sample Saturday giveaway! SHEfinds is a fashion blog, which you can check out if you click here. Every Saturday they give away 100 products, from makeup and skincare to fashion. 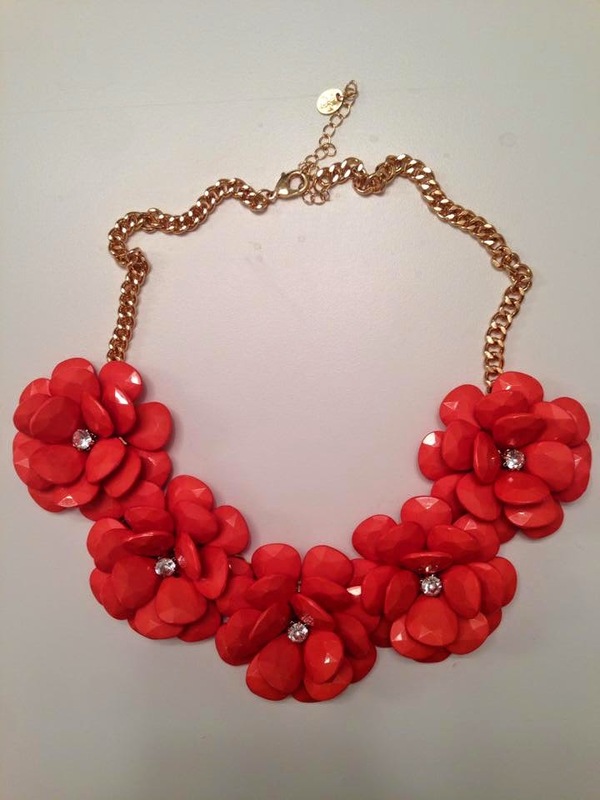 The giveaway my prize came from was for a statement necklace from Icing by Claire's and retails for $18.50. Happy hump day everyone! I have a quick mani to share with you tonight. 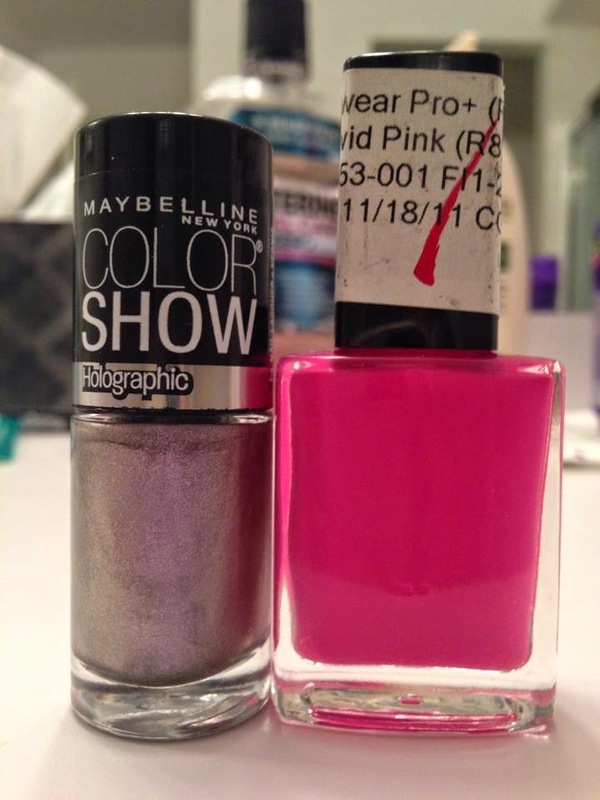 A while back I picked up a Maybelline Color Show holographic polish in the color Lavender Lustre. I would not describe this color as a holo in any way, and you can tell just from looking at the bottle, but it was super cheap and I thought the color was pretty so I picked it up. Here it is in two coats with a fun dot accent. Although the name of the Maybelline polish is misleading, I do like the color. It would have been better with a bit more purple. I'm still on the hunt for my perfect real holographic polish! Hey everyone! Hope you've all been having a nice weekend. For today's mani I used Zoya Zanna, described by Zoya's website as a "muted light rose-mauve or Thulite pink with subtle lavender undertones in a smooth creme finish." This color is just absolutely gorgeous and flattering. It definitely looks closer to lavender on my nails, although it looks more pink in the picture. 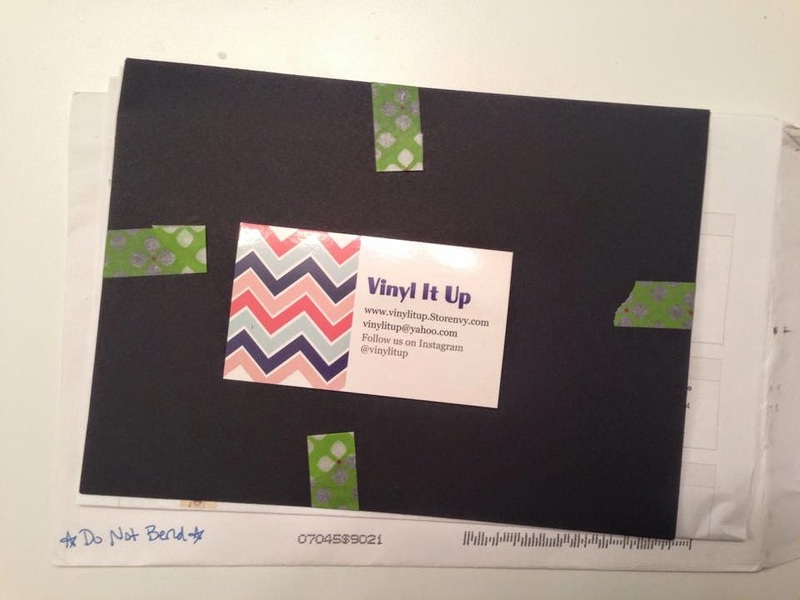 I paired it with Julep Julia, which I used on top of striping tape. 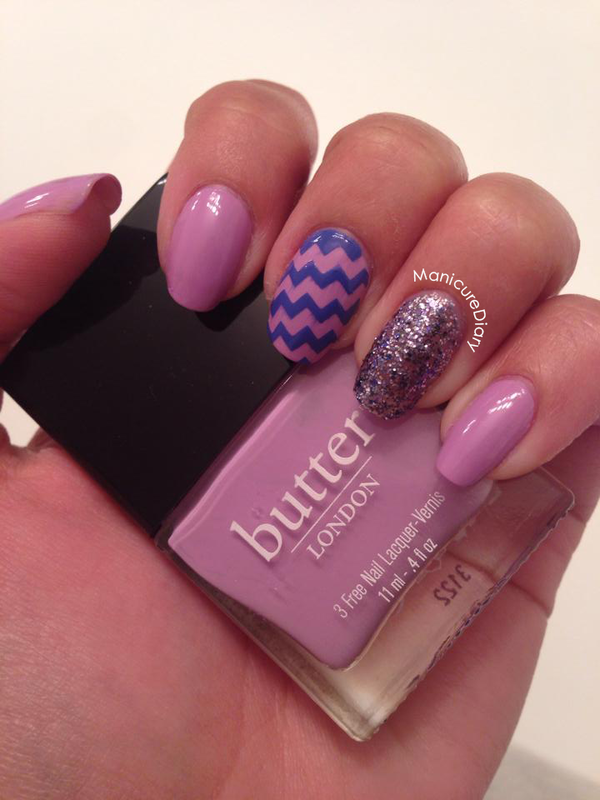 Julia is a "purple orchid with golden micro-glitter metallic." It is glittery perfection and looks beautiful over Zanna. I've really been enjoying playing with my striping tape and can't wait to try out more designs! Hey everyone! Tonight I used two of Avon's Speed Dry polishes for my manicure. 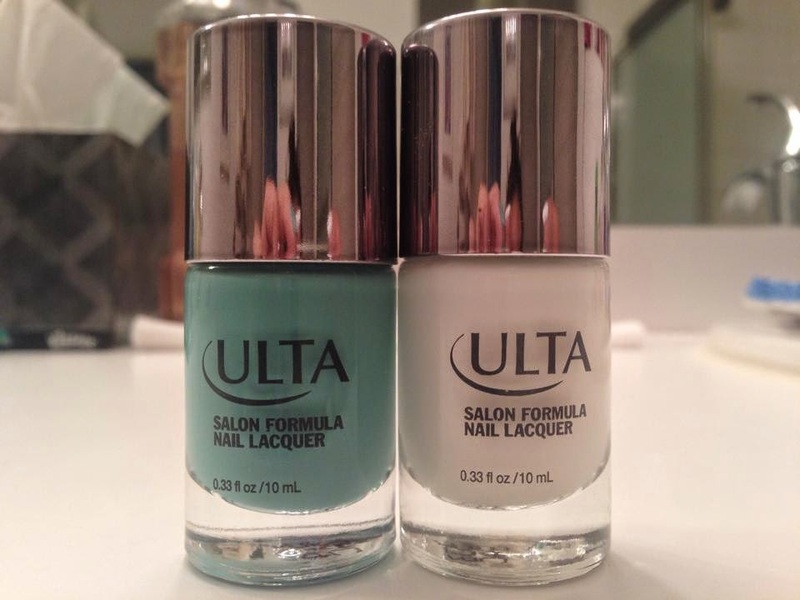 The formula was great for both polishes and they definitely did dry quickly. 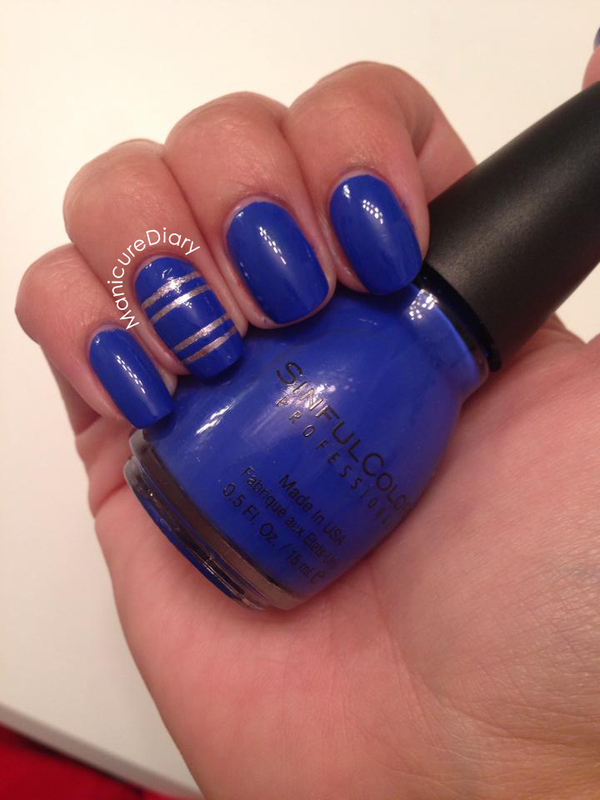 I wanted to use striping tape for this mani and here is the result. I love how it turned out, especially that pearly white. I think it's a nice change from a stark white cream base. I just need to wait longer to apply my top coat to avoid smudges. You can see where that happened on my middle nail. It was even worse on my other hand! Hey everyone! Quick update, my group is on the green team! The Green Twisters, to be exact. The theme this summer is Wizard of Oz. How cute is that?! Here is what I added to my previous mani. I remember when they released Priscilla as the birthstone polish for May and I thought, "ugh I hate green!" I purchased it anyway because I'm collecting all the birthstone polishes. Now I'm so glad that I have it! This glitter polish really is gorgeous. 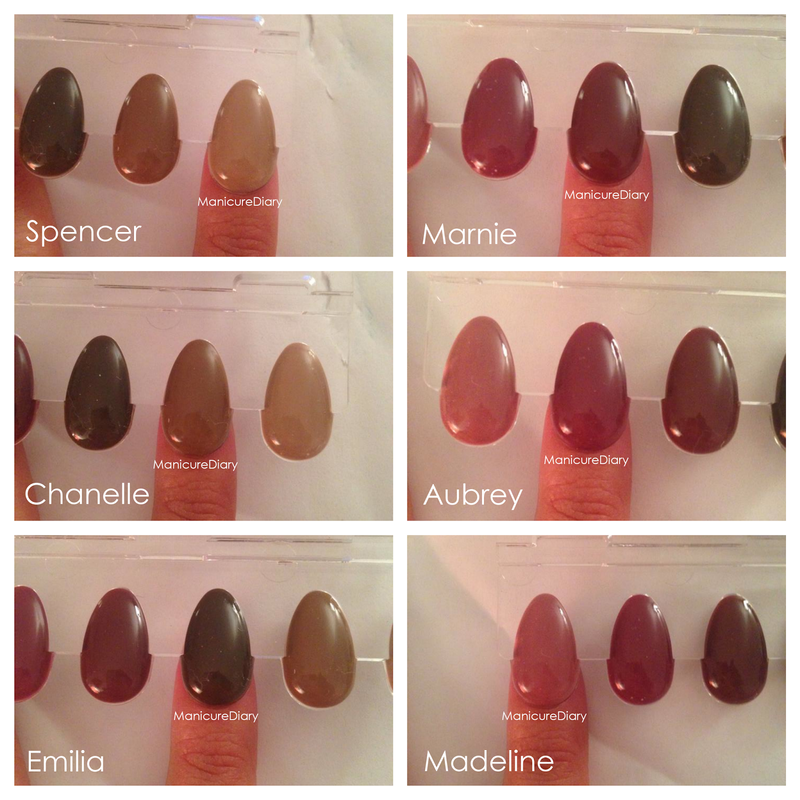 If you're interested in seeing the rest of the birthstone collection, click here to view it on Julep's website. Happy Manicure Monday! I hope you all had good weekends. I had a picnic in Central Park on Saturday and enjoyed the gorgeous weather. 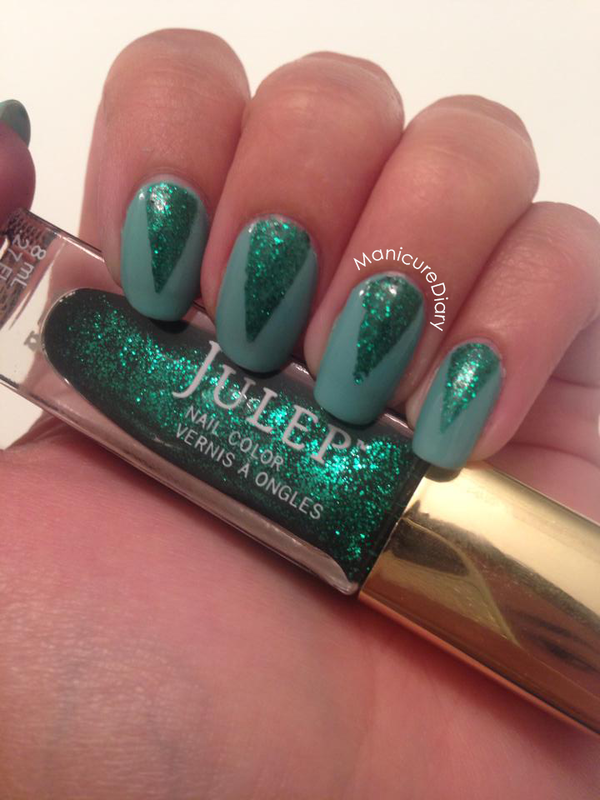 Today I've got a green and white mani to share with you. Why those colors? I work as a counselor at a day camp (perks of being a teacher!) and color war is starting soon. I'm not sure yet what team my group will be on so I decided to rock both colors until it starts. Once I know my team I can go all out with some fun nail art. 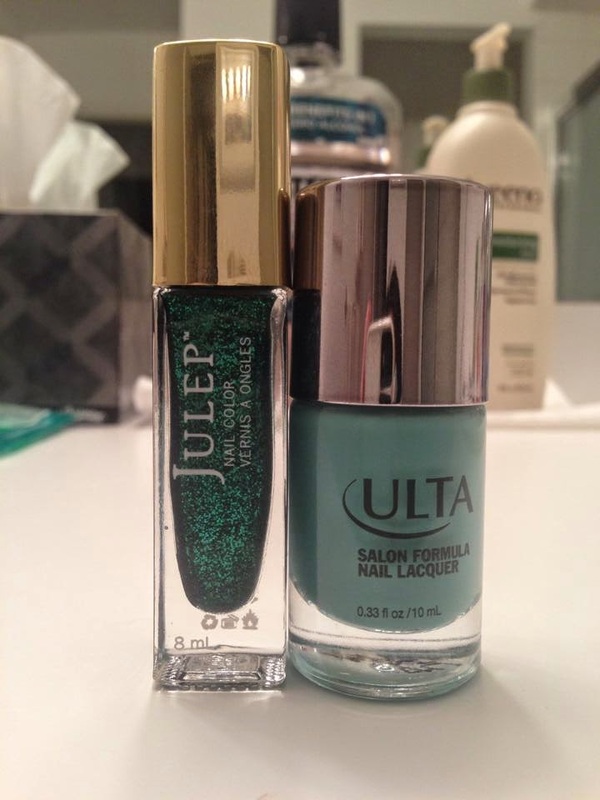 I used two of my Ulta polishes, Snow White and Mint Condition. The formula on these really isn't too bad. I will say that Mint Condition is easier to work with than Snow White. Hey everyone! 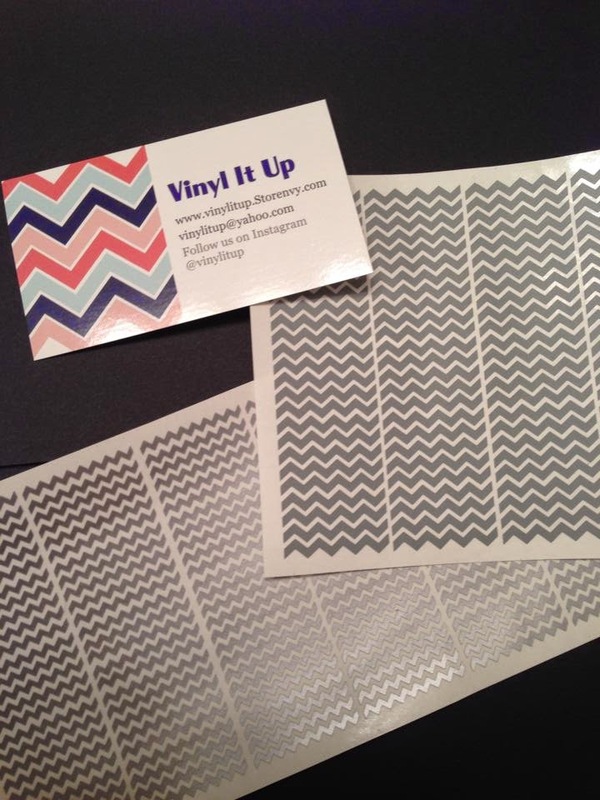 Last week I received my chevron nail vinyls from http://vinylitup.storenvy.com (click here to see that post). I used my small chevrons for a previous mani and tonight I tried out the mini chevrons. I love the way they look! Big tip, wait until your polish is completely dry before you use your top coat. My chevrons smudged a little because I'm so impatient! Hey everyone! I have a quick mani to share with you tonight. 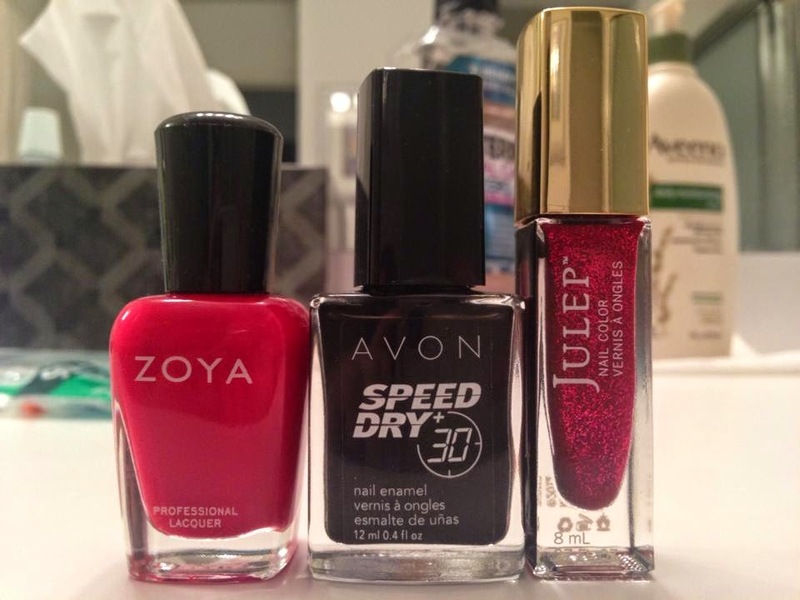 A couple weeks ago I posted a little Avon nail polish haul from my friend (click here to check that out). 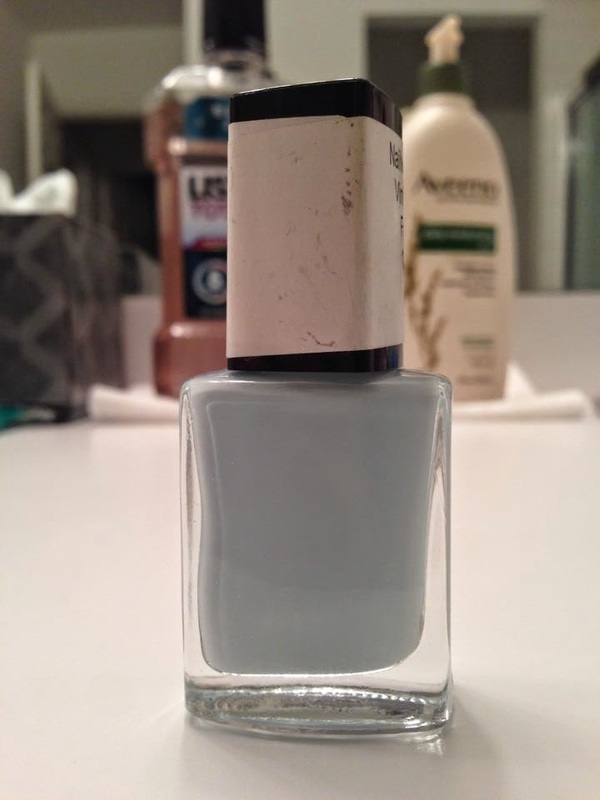 One of the polishes was a sample bottle of an old color called Vintage Blue. 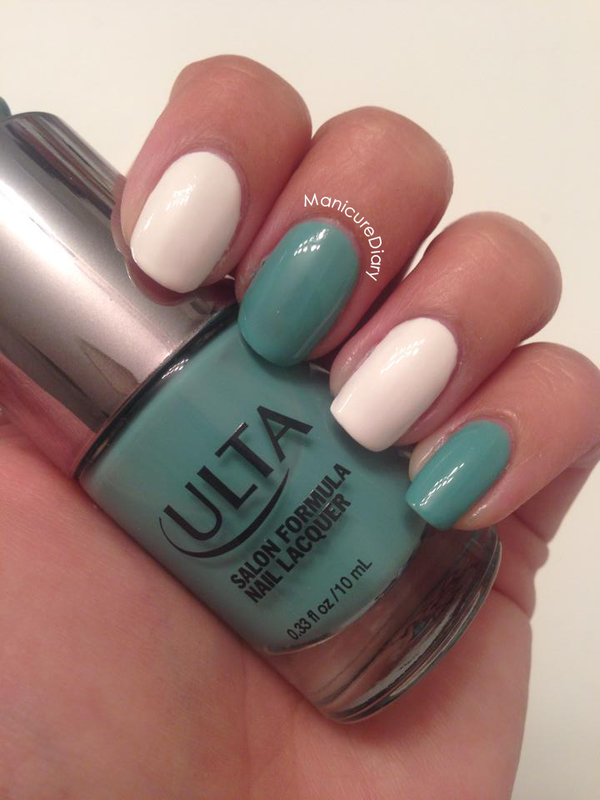 It's a gorgeous pale blue creme that goes on smoothly in two coats. Unfortunately I didn't know until now, after doing some research, that the color is discontinued! I'm absolutely in love with the color so I'm hoping to find a dupe. If you know of a good dupe for this color please let me know! Hey everyone! 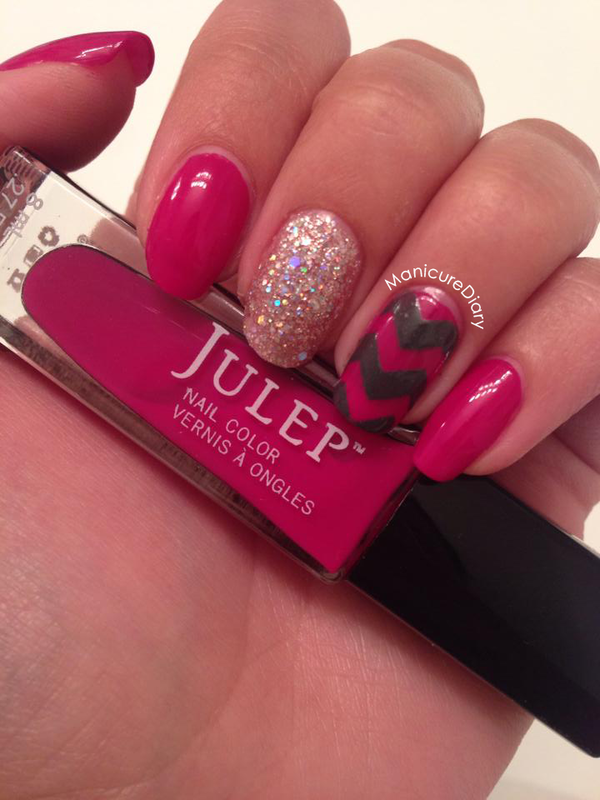 Today when I got home I found my chevron nail vinyls that I ordered in the mail! Happy Friday to me, right? I got them from Vinyl It Up on Storenvy. I purchased the small chevrons and the mini chevrons each in a set of 100 vinyls. There are a bunch of fun vinyls to choose from, and very reasonably priced. They arrived sandwiched between thick paper to prevent damage and came with a cute business card. And here are the vinyls. The mini chevrons are silver and the small chevrons are gray, which are the colors I requested. It doesn't really matter which color you choose because you take off the vinyl after you apply your nail polish. For tonight's mani I decided to use the small chevrons. As I mentioned in my striping tape post, linked here, you will want to use a pair of tweezers for peeling the vinyls off and positioning them on your nails. On my first try I had issues with my base color peeling up with the vinyl, so I repainted that nail and applied a top coat before using the vinyl and that did the trick. Remember to take off the vinyls while your polish is still wet! I love the way this turned out! I can't wait to play with the mini chevrons.